Since 1996, the Foundation continues to work thanks to your faithful support. In the past year, we have been happy to see more the tangible results: the small shoots continue to become beautiful trees, beautiful plants; young men and women become capable of living and working in the world, serving their community. A student, born in a village at 3790m above sea level, an orphan with an illiterate mother, has just received his master’s degree with distinction in Europe thanks to the Erasmus+ program! 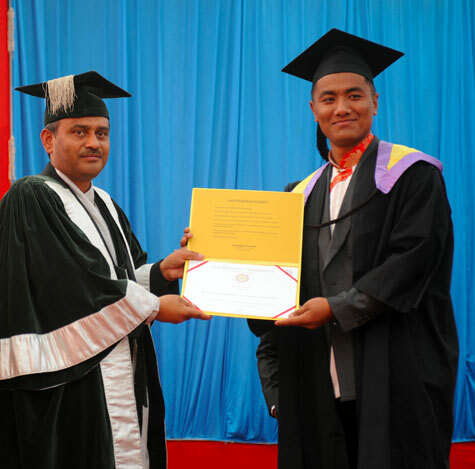 Another has completed his Bachelor of Engineering in Kathmandu… Another was named “Student of the Year” during her last year of bachelor’s studies in Social Work. In order to continue this work, our Foundation still needs your support and new contributions to carry out our unique project. We are looking for at least two new sponsors to join us in 2019 as well as generous donors to help promising young students through graduate scholarships. Thank you in advance for the help you can provide to support the development of our Foundation which brings hope. * Namaste, widely used in Nepal means “Hello”.